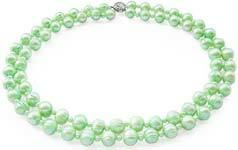 Right from the moment you lay your eyes of the wide selection of bright green pearls that you see here, its important to dispel with the myths that may be running through your mind. Luminous green pearls are only for those with tiny little figures and fine features. On the contrary. 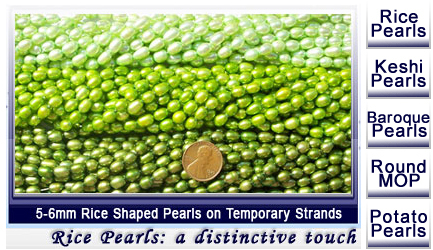 The plus sized woman can wear a strand of the green rice pearl strands and enhance every feature that she possesses. Green pearls are only for the shy and quiet type.Green pearls such as the green southsea shell pearls are meant to bring out the wonderful boisterous character of the bold and beautiful and at the same time compliment the dainty nature of the shy and quiet. Green pearls are only meant for the youngest. This is probably the biggest myth of all. All one has to do is look at the exquisiteness of the green pearl and it raises the question as to why would this pearl only be reserved for the youngest when it is an item of beauty that any girl for that matter has the right to wear? So now that you have put the myths to rest and have reached the conclusion that you not only have the right to wear any combination of green pearls that you want, you deserve to have at least a few pieces of this fine pearl jewelry for yourself. Now the next thought you are faced with is which do you choose when there are so many combinations and shades of green pearls to be found here? One of the great benefits of shopping here is that you will have the opportunity to choose several pieces because of their affordability. In addition to this there are so many settings to choose from that you really can make your green pearl collection very personalized. 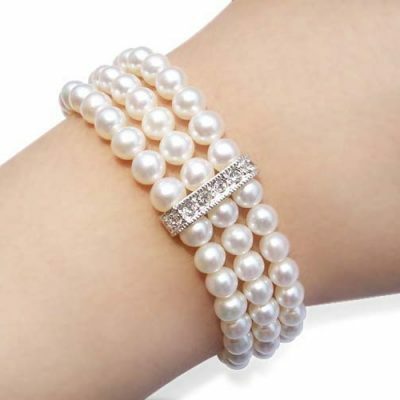 In fact you can even make your own fashion statement in jewelry by buying these authentic high quality green pearls separately and make your own one of a kind pearl jewelry. Aside from the variety of shades of green pearls you need to consider the size of the pearls that you find most attractive and the shape as well. For example for the women on your list, why not choose the green pearl button earrings for her birthday for only $5.99, then at Christmas add the green pearl pendant . You may even want to suggest to others that are buying for the same individual that they purchase the matching green pearl ring. What individual would not cherish receiving an entire collection of the highest quality authentic green pearl jewelry that can be found on the market? No doubt you are going to want several pieces from the green pearl line yourself, but consider a whole selection of gift giving combinations. As we can process green pearls with any color overtone. Just email us at support@orientalpearls.net, we will do the rest. 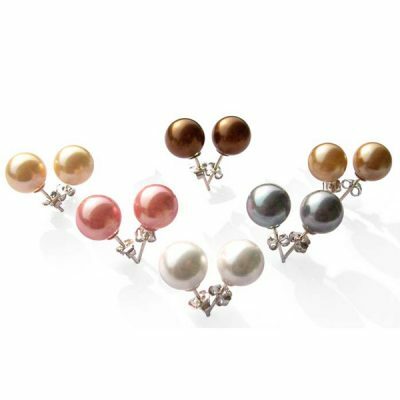 The green pearl jewelry line can take the guesswork out of your gift giving list for an entire year.